Rameau in fact wrote two unrelated opera entitled Anacreon and featuring the Greek philosopher-poet. The earlier of the two, to a libretto by Cahusac has been recorded on Signum Classics by the Orchestra of the Age of Enlightenement and the Choir of the Enlightenment conductor Jonathan Williams, with Matthew Brook as Anacreon, Anna Dennis as Chloe and Agustin Prunell-Friend as Batile. 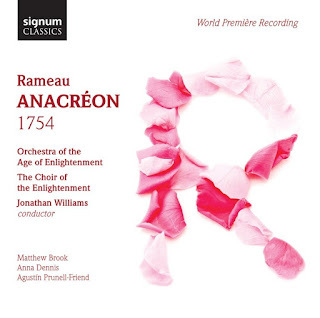 Rameau seems to have written Anacreon as part of a multi-act opera-ballet called Les beau jours de l'Amour which was started in the 1750's but remained unfinished. The two surviving acts Anacreon and La Naissance d'Osiris both developed independent lives and Anacreon was given at Fontainebleau in 1754. There was a Paris Opera production of the work in 1766, two year's after Rameau's death but incorporating revisions made by Rameau and Cahusac after the 1754 performances.. Reviving the piece is, however problematical. All we have from 1754 is the libretto and an incomplete set of vocal parts, which can be supplemented from surviving material from the Paris Opera's performances in 1766 and 1771. The overture is, however, entirely lacking and the work on this disc starts with just a short Ritournelle. Jonathan Williams, who conducts this recording, is Director of College Music at St Hilda's College , Oxford and a research fellow at Oxford. His doctoral thesis was on Rameau and he was heavily involved in the events of the Rameau centenary year which included a semi-staged performance of Anacreon complete with dancers. 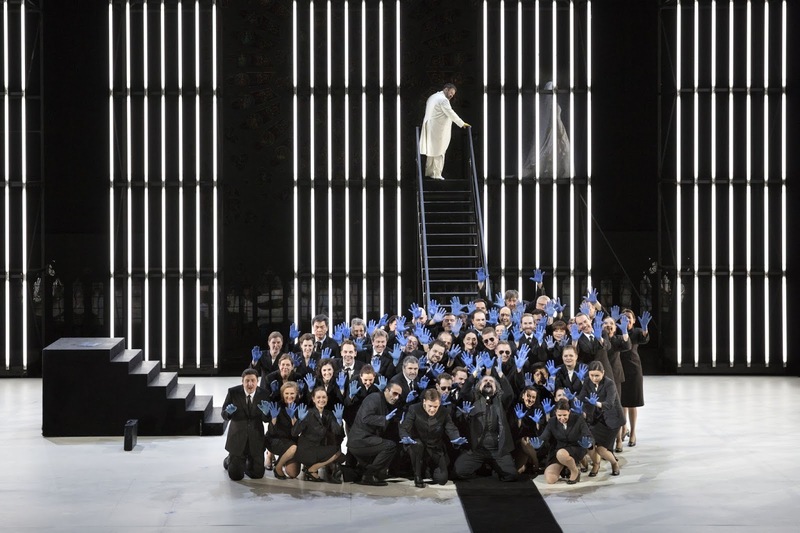 This recording, the first studio recording of the opera in in 30 years, benefits both from recent scholarship and from the performances of the opera which OAE gave. The plot such as it is, is rather thin and very much an excuse for a series of delightful entertainments. 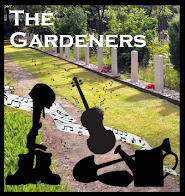 The elderly poet Anacreon (Matthew Brook) is enjoying his garden; he has organised a celebration, for reasons he keeps secret, at which his pupils will put on an entertainment. Two of them Chloe (Anna Dennis) and Batile (Agustin Prunell-Friend) will be delivering odes during the entertainment. Anacreon teases Chloe, who is confused by her feeling and begins to think Anacreon loves her though she herself loves Batile. Anacreon has organised the celebration to make Chloe and Batile realise they love each other, and all ends with a Bacchanalian celebration. 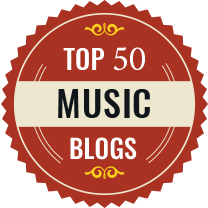 We should not let this rather poor plot detain us, it is simply the frame on which Rameau hangs some superb music. Inspired by the advent of Bohemian horn players in Paris, Rameau's orchestral writing is richly imaginative with great use made of this instrument. The vocal contributions are short airs embedded in fluently stylish recitative. The style is generally galant, and all the performers capture it well. Matthew Brook makes a fluent Anacreon, singing the fluid line with ease especially in the upper voice. Anna Dennis is simply delightful as Chloe. She gets the lions share of the song, and performs with pellucid tone and great charm. Duetting with a flute more than once, Anna Dennis really does charm. Agustin Prunell-Friend is nicely characterful as Batile, though his haut-contre can sometimes develop a little edge to it, particularly in his imaginative final ariette Qu'Anacreon dans ce sejour. The final Bacchanalian celebration is the longest scene in the opera, opening with a superb Air pour les Bacchantes full of striking orchestration with prominent horns and percussion. The Orchestra of the Age of Enlightenment play stylishly and with great elan for Jonathan Williams with some lovely contributions from the Choir of the Enlightenment. Having given the piece in performance, the performers bring a stylish verve and engaging enthusiasm to the music. This is a disc full of great charm. There is no real drama, simply an excuse to enjoy Rameau's delightful imagination. Recorded in All Saints' Church, East Finchley, 14-15 February 2014.